The GW Orchard Project was an initiative by Allison DeSarro--a junior at GW--working with the Grounds Committee to transform an unused parking lot median into a productive tree orchard. The site, located in the school's lower south parking lot, is highly visible from Leetsdale Boulevard and surrounding community. The Committee noticed that the area was overrun with weeds and diminished the school's image. In April of 2013, the space was planted with several varieties of fruit trees--totaling 9 semi-dwarf apple trees and 2 pear trees. In the spring of 2014, 2 peach trees and 2 apple trees were added to the orchard for a total of 15 trees. The orchard is on its own water efficient, drip irrigation system that was added onto an existing waterline. 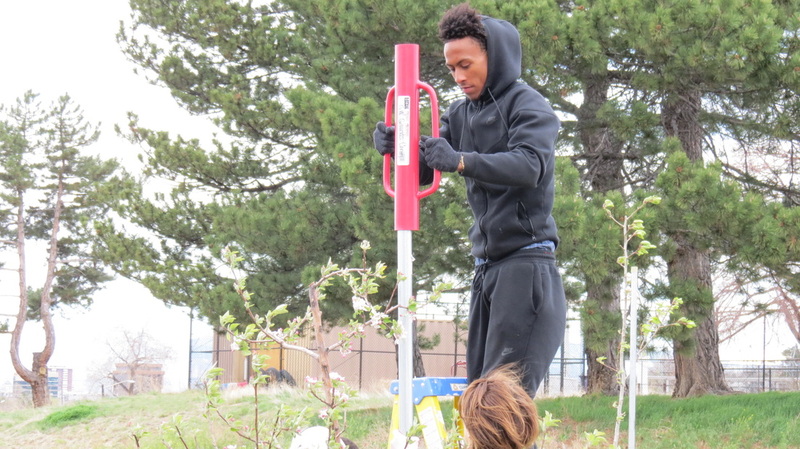 The student-run GW Grow Club helps maintain the orchard through winter watering, staking, pruning, fertilizing, checking for pests and harvesting the fruit. The eventual fruit from the orchard will be used in the GW cafeteria for breakfast and lunch. Biology, art and other classes are also invited to use the orchard for learning. The Orchard continues to be funded through personal donations, as well as contributions from Whole Foods and Whole Kids. If you would like to make a donation in order to help fund the orchard please click here.